Just around the bend on the Appalachian Trail, wedged someplace between the border of North Carolina and East Tennessee, sits a clearing, a ridge of sorts, with the most tremendous view of the valley below. It's a place called Silers Bald. As a spot along a hiking trail, "Silers Bald" makes at least a little bit of sense. As the identity of a pop-rock band, well, it seems a bit more obscure. But when you get to know the members of this close-knit foursome from Irmo, South Carolina, the name Silers Bald actually becomes rather fitting. "We all long for a time in our life when we have those moments of clarity, moments when we get a view of what life is about and what really matters," explains the group's guitarist and backing vocalist, Warren Bazemore. "Silers Bald provides one such moment. It is a place to rest, to find shelter, and to refuel for the rest of the trip. We hope that our music offers the same: the comfort of home, the clarity of an unencumbered view." Formed in 1996, the band has walked a long and interesting road to arrive at its present moment of clarity, now reflected in the music of its Essential Records' debut, Real Life, produced by Josh Moore of Caedmon's Call. Nearly eight years ago, Bazemore and Shane Williams (vocals/guitar) were kicking around in their dorm room at the University of South Carolina, playing covers of rock and roll favorites by Van Morrison and Counting Crows. Before they knew it, a large crowd had assembled outside their balcony to listen, and soon, interest on campus led to their first audition at a nearby coffeehouse. "Shane and I spent about four hours going over the three songs we knew. It was our first audition, and we were a little bit intimidated," Bazemore describes. "We pulled up to the coffeehouse and practiced a couple more times in the back of Shane's truck. When we felt comfortable, we went upstairs to the coffeehouse. The owner came out and told us that he had heard us in the truck, and that we could play the next Friday. We did all that work to prepare for an audition we never realized we were having." Performing an average of 150 shows a year in at least 27 states, Silers Bald has gone through five touring vehicles in the course of its career. The group has rotated a few bass players in and out of the mix and evolved from harmonizing folk to more of a straight-ahead pop-rock sound. Silers Bald also released four independent projects, including Live At Town Theater, recorded with a 20-piece orchestra in 1998, and its acclaimed self-titled collection in 2000. As an independent band, Silers Bald has sold in excess of 40,000 records to date and shared countless adventures together. "We've laughed, we've cried, we've loved, we've been rained on, had ants bite us, almost been burned, nearly been killed by a falling microwave oven, and almost fallen to our deaths off an icy road in western North Carolina. But we've only missed one show in almost eight years," Jacobs recounts. You'd think that a band with this much history and mileage under its feet would be nearing the end of its career. But experience has only bound Silers Bald together even tighter, bringing it to a significant fork in the road last year. Although in many ways it had reached the pinnacle of its independent career, the band's resources were all but gone, and the group was beginning to look for some new direction. Several record labels began courting the highly sought-after foursome, but none seemed to be the desired fit. "Our prayer was simple," Williams explains. "God, this has always been your thing so if you want it to continue, show us how." Around that time Cliff Young, Caedmon's Call frontman and founder of WaterShed Records, an imprint of Essential Records, approached Silers Bald. At first, this seemed an appropriate home for the band, but it wasn't long before Robert Beeson, senior vice president of A&R for Provident Label Group also realized the group's budding potential and wanted to add them to his Essential roster. 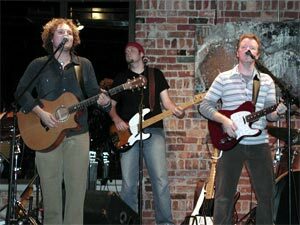 By the beginning of 2003, Silers Bald had signed its first record contract. "For years, Silers Bald has flourished in the independent music realm, establishing a sizeable fan base," comments Beeson. "The band definitely falls in line with our company's philosophy of backing artists that have already garnered momentum on their own." Under the direction of producer Joshua Moore, pianist/writer/producer for Caedmon's Call, the members of Silers Bald set up shop at a Music Row studio in Nashville, Tennessee to record their organic yet progressive sound, likened by Seventeen magazine to mainstream acts Goo Goo Dolls and Dave Matthews Band, on the group's first label project, Real Life. Capitalizing on the band's diverse talents, Moore helped to revive Silers Bald with fresh sounds and a renewed vision for its music. That enthusiasm swells through every compelling moment of Real Life, from dancing notes of the hook-laden hammered dulcimer to intense vibrations of alternating fiddle and electric guitar-driven solos. Laced throughout original melodies, earnest vocals, and intriguingly candid, true-to-life lyrics, you'll sense the presence of divine inspiration at work. Williams, the group's primary lyricist, says he derives songs from poetry, personal observations, biblical accounts, and his most intimate relationships, always with an aim to shatter false realities and point people to the truth. "We were truly made for so much more than the illusions we accept as real life," Williams explains, citing the album's title. "The Westminster Confession sums up our purpose in a wonderful way-'To know God and enjoy Him forever.' For us, music is simply the most powerful vehicle to set such a purpose in motion." Bazemore agrees. "We live in a culture that is so cynical of religious institutions that it will take an open and honest discussion of the mysteries of God and the goodness of faith to change people's hearts," he describes. "I hope that this album can help bring about that sort of dialogue." Silers Bald will have plenty of opportunities for conversation, with its concerts remaining a central aspect of what it's all about. Not only does the band have a huge following among college and church audiences, it's also a mainstay at summer camps and weekend retreats. Additionally the band has joined with new labelmate, singer/songwriter Andrew Peterson on his annual Christmas Tour the past three years. When performing, Silers Bald rarely follows a set list, preferring to let each unique concert atmosphere dictate where the music goes. The group often jokes that its concerts are simply an excuse to hang out with people. Void of slick production or anything even remotely forced, its live show centers on connecting with fans through conversation. "There is nothing different about us just because we're on stage performing, and the moment someone is able to realize that, is the moment real ministry happens," explains Myers. "Thankfully, God calls us also to excellence in what we do, which is what makes it fun, but the value and worth of the music lie in its ability to carry God's love to the world." Revealing its dedication even further, Bazemore recalls, "About three years ago at Kansas State University, we had finished playing and were meeting people and sharing stories. A girl came up and began to tell me about her college experience and how it was different than she had thought it would be," he remembers. "Then she said, 'I used to know what it was like to really know God; that used to be a big part of my life. Tonight you guys made me miss God.' If I could know that every night we made people stop and consider the relevance of the claims of the Gospel on their lives, then I feel like we have accomplished a great thing." That's not beyond the realm of possibility, as great things seem to follow Silers Bald wherever it goes. And now, with its inspiring new album, Real Life, and a firm grasp on what makes it all count, Silers Bald can enjoy the view, bask in the accomplishments behind it, and start gearing up for the trip ahead.